O’s happy. She got what she wanted. Sort of. 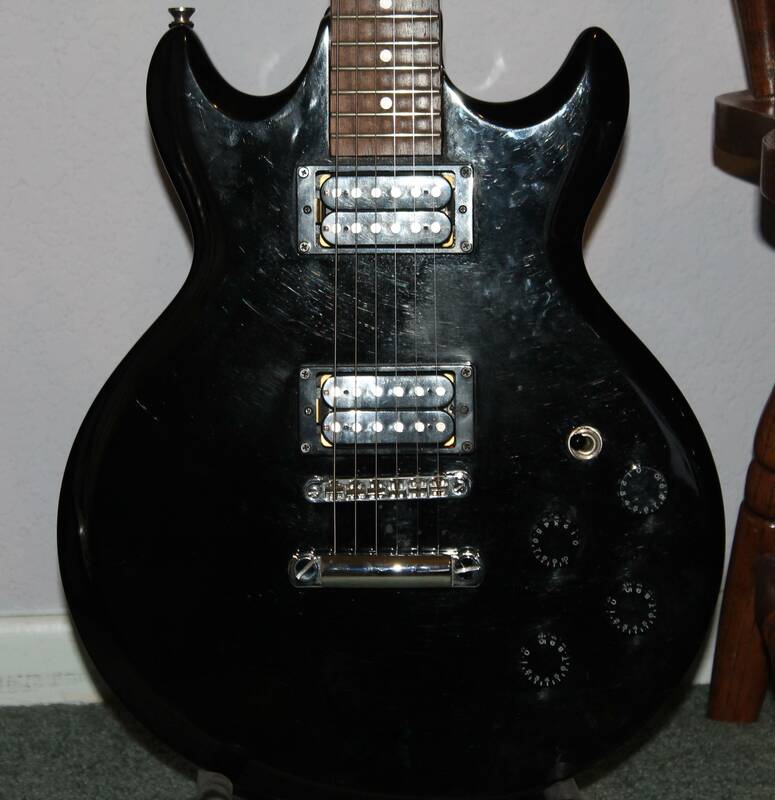 She wanted a 1996 Gibson Les Paul Standard, but we don’t have $1400 to spend on a guitar right now. Instead, she is settling for something that sounds alright for now and it didn’t break the bank. I got it used for about $80 so I can’t complain. We liked the style (double cutaway), but we were hoping for a red finish. All we could find was black so it will have to do. It does have 2 humbucker pickups so that’s a plus. Clean it sounds pretty decent. When I run it through the Death Metal pedal it screams and wails like we want. I don’t have the greatest amplifier. We’re looking into getting something new very soon. Here are a few photos. The Ibanez GIO Double Cutaway next to its cousin the Ibanez acoustic. Close up of the body. You can see all my fingerprints all over it! We are thinking of getting something else in a couple of weeks. 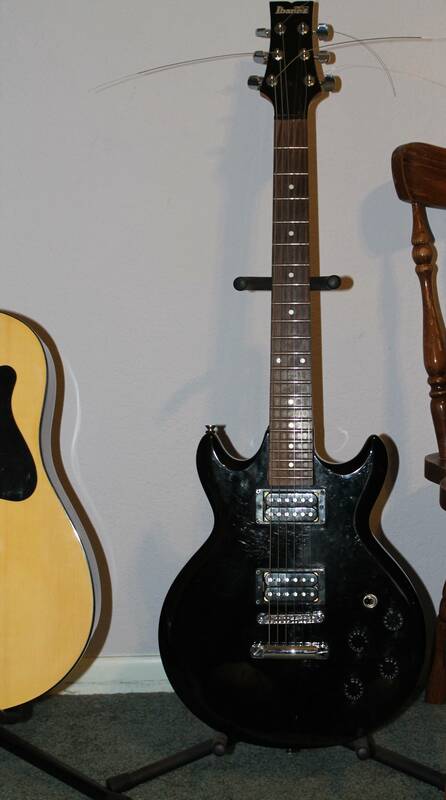 Tried out an Epiphone single cutaway studio, also with 2 humbuckers that is going for about $300. Ran it through one of the amps where we tried it out and it sounded amazing. This Ibanez is nice to just toy around with, but that Epiphone is usually a $700 guitar and it sounds like it. Only bad thing about it? It’s also black! Ugh! Picked up the latest from Soundgarden. It’s a greatest hits compilation and it has some really terrific stuff on it. It’s 2 discs with all their best known stuff plus a dvd that has all of their videos. It was $20, but well worth it seeing as how you get 24 tracks and 20 music videos. Been jamming to their stuff now for the last day or so while trying to get back into school mode. I was in class today and didn’t really feel like being there, but since it’s paid for I figured I’d at least pay attention and take notes. It was easy stuff. We didn’t have an assignment or homework in History and our English Professor flaked on us today so it was short and sweet. Still having trouble getting my last 2 books and it looks like I may have to order them online which means more waiting. The teacher for that class is pretty cool so he isn’t freaking about us getting the book, but says we definitely need to as the class goes on. Talked to my friend on the west coast and she is dealing with some crap so I have been trying to keep her spirits up which is part of the reason I am not posting as often as I used to . That’s all fine with me though. I am not living to be a blogger, but mostly do it to keep things off my chest when there isn’t anyone to talk to. The editing on the book is still sitting, but I am expanding the idea for the follow up so it’s not as if I am sitting on my hands.